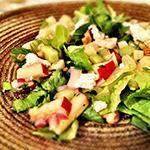 This is a refreshing summer salad, full of vitamins and perfect for hot days. 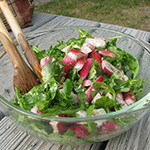 First of all, wash the salad, fennel and apples and peel the onion.Â SeparateÂ the salanova leaves and put in a salad bowl. Thinly slice the fennel, roughly chop the apples and dice the red onion before adding to the bowl. Chunk over the feta cheese and drizzle with the oil and salt. Mix and enjoy! Wash the rocket and dry well. Then place in a large salad bowl. Wash the radishes before rustically slicing them lengthways. Add them to the salad bowl. Now prepare the dressing. Juice half a lemon and mix well with olive oil and chopped dill. Add to the salad just before serving, and season to taste. 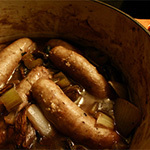 Heat a couple of spoonfuls of oil in a pan and fry your sausages on a medium heat for about 5 minutes, stirring when coloured on each side.Â Add the onion wedges and cook until golden. Add the apples making sure you stir gently so as not to break them.Â Add the flour and cook for two minutes. Slowly add the chicken stock, stirring until it thickens. Make sure you donâ€™t add too much or youâ€™ll get a soup. Drain your lentils and add to the casserole with some fresh sage, then stir in the mustard.Â Simmer gently for 10-15 minutes adding more stock if necessary. Serve with crusty bread or mashed potatoes. Preheat the oven to 240C. 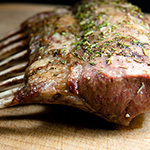 Place the racks of lamb on a large baking dish and sprinkle with the thyme, fleur de sel and freshly ground black pepper. Drizzle with olive oil and place in the oven for 10 minutes, basting frequently. Remove the racks of lamb and leave to rest, covered in foil for 5 minutes. While they are resting, pour off the fat from the pan. Add a spoon of hot water and deglaze the juices. Bring to the boil and whisk in 10g of the butter. Halve the mirabelles, removing the stones. Heat the rest of the butter in a pan over a medium heat. SautÃ© the plums, stirring gently for a few minutes. Sprinkle with the sugar and carmelize lightly. Now simply plate the racks, surrounding them with the mirabelles and the jus on the side. 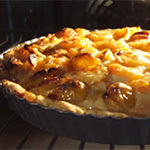 If you are making your own pastry, first pour the flour and sugar into a bowl or onto a work surface. Add the cold butter, cutting it into the flour into small pieces. When the pieces are small enough, work very lightly with your hands to produce a crumbly texture. Add the egg and salt, mixing with a fork. Grate in some lemon rind. Then gradually add in the water. Press the mixture together - it should have a grainy texture. Wrap in cling film and pop in the fridge for 20 minutes. Then roll out onto a lightly floured surface using a cold rolling pin. Own pastry or not, you will now need to preheat your oven to 180C or gas mark 4. Butter the tart mould and line with your pastry, letting it extend slightly over the edge (you can tidy this up in a minute). Blind bake it for 10 minutes, you can throw in a handful of dried beans so that the pastry doens't bubble up. Remove from the oven and trim the edges. Let it cool for a while. Now halve and stone those amazing mirabelles and lay them on your pastry base. Beat the eggs and flour in a large bowl, then add the sugar and cream to make a batter. Pour this over your fruit and spread evenly. Place in the oven for around 35 minutes, checking regularly. This is delicious served hot or cold. Enjoy!